Mr Farrell's training is coming along nicely, apparently. He's been in full contact sessions with his team mates as well as hitting the tackle bags. But the boss Alan Gaffney says he won't be ready until the Brisol game on 10th September. Pity, I was looking forward to seeing him run out at Twickenham in a week's time. Oh well. Hilly's also making great progress, and might be back on the park by the end of October. 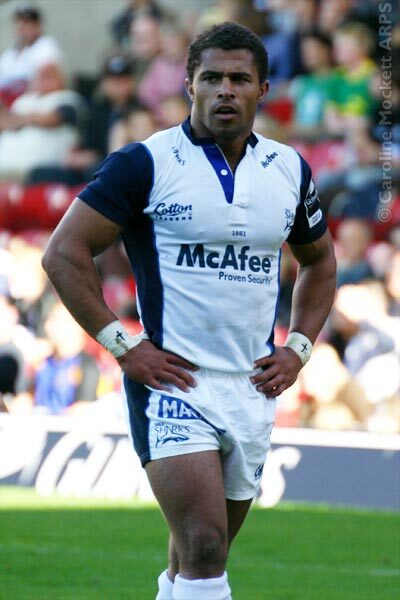 Also, the coaching changes at HQ may possibly tempt Jason Billy Whizz Robinson out of international retirement. He's certainly been flying for Sale at the end of last season. And if he stays in-form this year, who knows? Here's a picture of Jason the day after he announced his international retirement last autumn, playing for Sale against Sarries.